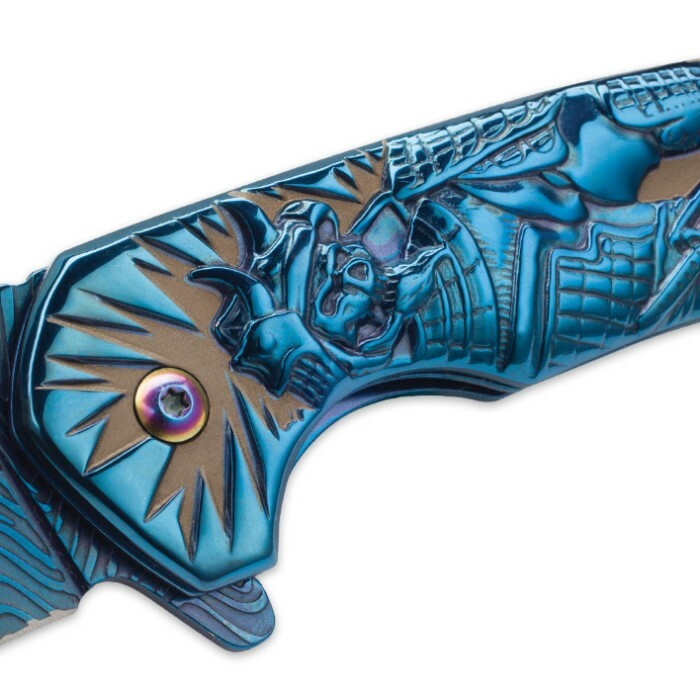 Breathtaking and bold, the Shadow Warrior Pocket Knife Collection is a dazzling kaleidoscope of color and form that exudes splendor and demands attention. 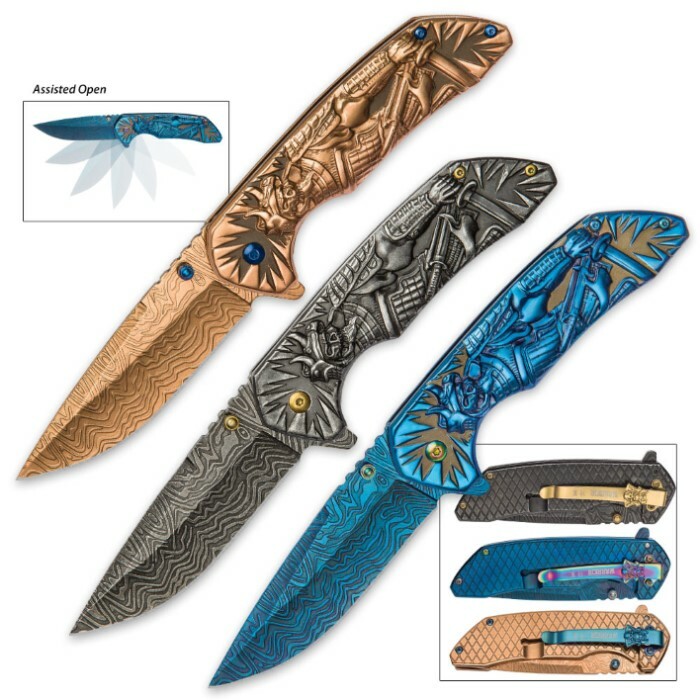 It combines all three "Shadow Warrior" assisted opening folders, each a savage beauty all its own, with its own unique aura and color scheme – vibrant metallic blue, stately gold, or rustic pewter-esque gray. Vividly contrasting hues adorn the pivot pins, thumbstuds and pocket clips, providing brilliant, eye-catching visual dissonance. Cast from rugged stainless steel, each handle features a spectacular relief design, which depicts a shadowy shogun warrior with a ghoulish skull complexion. The ghostly figure clutches a deadly katana sword and dons the iconic plated armor and elaborate battle regalia of the ancient Orient. Hollow eyes glare menacingly from beneath sinister horned headgear, and stratified gauntlets encircle the cryptic warrior's stout wrists. The knives' DamascTec steel drop point blades are equally impressive, each carefully honed to razor sharp and blanketed in a hypnotic array of etched waves, ripples and whirls. Each blade deploys near-instantly, thanks to the advanced assisted opening mechanism - easily activated via either the ambidextrous thumbstuds or the handy blade spur. 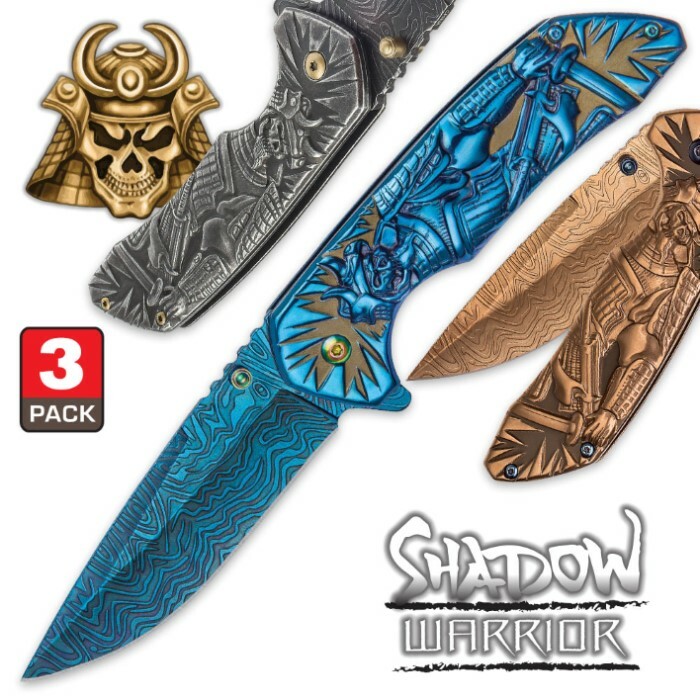 There's no question - each Shadow Warrior folder is a unique masterwork of cutlery engineering and design. Together, this distinctive trio is beyond compare - an awe-inspiring fusion of magnificent beauty, impeccable function and unequaled value. 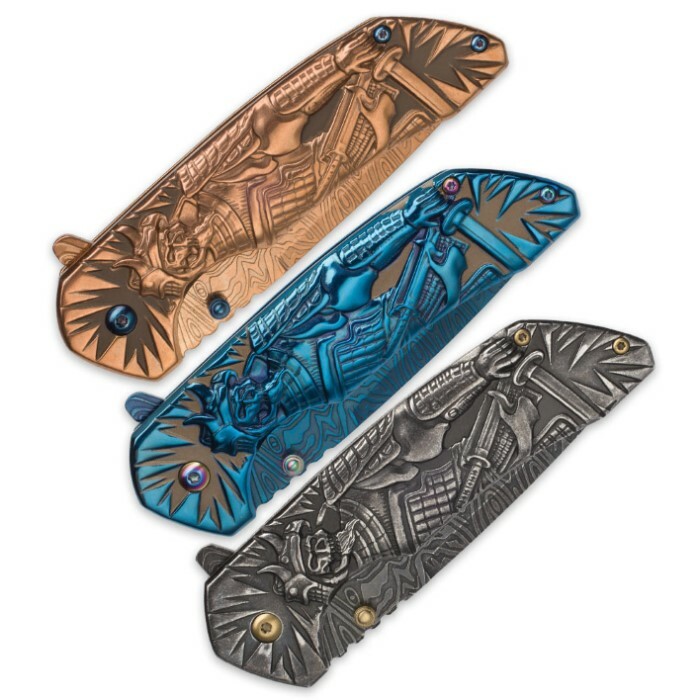 You won't find anything like the one-of-a-kind Shadow Warrior Pocket Knife Collection anywhere else – it's a multicolored, multifaceted gem in a desolate landscape of ordinary, uninspired folders. I got the gold and blue one from a mystery bag. The gold one is probably the sharpest knife I got from this site. Opens extremely fast and is extremely sharp. The blue one on hand is a bit slow to open and isn't as sharp as I liked but my girlfriend loves the color of it. Would consider buying the set next time. I've got em all. I like em all. Heft,looks,smooth action,good price,fast delivery. These looked really cool and couldn't decide which one i wanted. I decided to get the set of 3 because for the price just made sense. Right out the box they are sharp and look really cool and after you open them a few times and play with em they open really smooth. Deff might buy more for gifts and recommend you buy some for yourself as well because these are some of my favorites in my collection. I recieved the Dark Gray one in a "SHTF" bag I purchased, gonna get the set now, maybe get more for gifts, Sharp out of the box ! I could not believe how awesome these knives are. Let alone that I got three for the price of one. The damastec affect is cool. They are all sharp and much bigger expected. Get this trio of knives while you can. Thanks BudK!